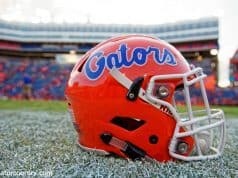 The Florida Gators aren’t finished yet. After controlling the game from the tip, the No. 10 seed Gators let a big lead slip away, but held the No. 7 seed Nevada Wolf Pack off just long enough to close out a 70-61 victory in the first round of the NCAA Tournament. Jalen Hudson hit a three-pointer within the first few minutes to give Florida a 9-6 lead, and it just felt like if the Gators could keep that shooting up, they would be set. But they would also need to fight off the big bodies of Nevada to stay competitive on the boards, and early on, no one could contest Jordan Caroline. He grabbed three offensive rebounds in a matter of a minute to tie the game 13-13 and eventually draw a foul, get to the line and make a free throw to go up by one. Then, Florida proceeded to go on a 9-0 run, led by a couple big baskets from Kevarrius Hayes and Hudson’s second three-ball. With the Gators up 22-14, Nevada answered right back with a 9-0 run of its own. Florida stretched its lead back to seven in the final minute as Hudson continued his stellar first half with another triple. The Wolf Pack had the ball with a chance to take the final shot, but Andrew Nembhard had other plans. He stole it and found Hudson for a slam to put the exclamation point on a strong first half for the Gators as they took a 37-28 advantage to the locker room. Florida was shooting close to 50 percent, and after getting outrebounded 10-2 over the first 10 minutes of play, it closed the half outrebounding Nevada 12-2. KeVaughn Allen didn’t score at all for the Gators in the first 20 minutes, but he found his shot to start the second half. He made three straight shots to give Florida its first double digit lead 44-33. Then, his teammates just continued to pour it on as Florida found itself cruising to a 12-0 run with Nevada on a six-minute drought. Leading 51-33 with 14:03 remaining, the Gators were already making plans for a couple more days in Des Moines. Unfortunately for the Gators, Allen was not the only shooter ready to wake up for the end of the game. Florida knew the damage the Martin twins could do, and they still had plenty of time to go on a tear. Soon, they led the Wolf Pack on an 11-3 run, while offensive rebounds by Caroline and Tre’shawn Thurman continued to haunt the Gators. Florida’s 18-point lead shrank to 10 in the blink of an eye. Mike White thought his team could kill the momentum Nevada gained before things got out of hand, but then he saw Florida starting to revert to some of its old ways from the beginning of the season. Players were watching the clock, playing scared and just hoping they could hang on a little longer. All the while, the Wolf Pack were controlling the pace of the game. 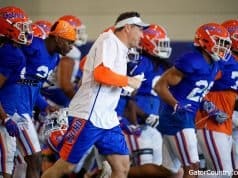 The Gators had kept the tempo going nice and slow all night, but Nevada started speeding things up. On top of that, Florida couldn’t stop fouling. And when Hayes went to the bench with his fourth foul around the 10-minute mark, the Gators felt the blow. With 7:18 to go, Caleb Martin made a layup in transition and got to the line for a three-point play. That made it 58-49 and opened the floodgates for 17 straight combined points by the Martins. At the final media timeout, Florida was just holding on for dear life, up 60-57. A flagrant foul by Caroline sent Hayes to the foul line all by himself. He had been reliable there all night, but had just taken a shot to the head and made just one of two attempts. The Gators got the ball back after the free throws, but couldn’t do anything with it. A Nembhard foul put Caleb back at the line, and he made both to make it 61-59. Hayes redeemed himself with a couple made free throws just before being called for his fifth foul with 2:02 on the clock. He went to the bench uncertain if that would be the final play of his college career. Caleb knocked down both free throws again, bringing Nevada back within two points. Nembhard stayed calm, holding onto the ball as long as possible before driving in for a layup to make it 65-61 with 1:36 left in the game. After the Wolf Pack missed a three on the other end, Dontay Bassett grabbed the rebound, and Keyontae Johnson ultimately found him for a clutch dunk at the 47-second mark. 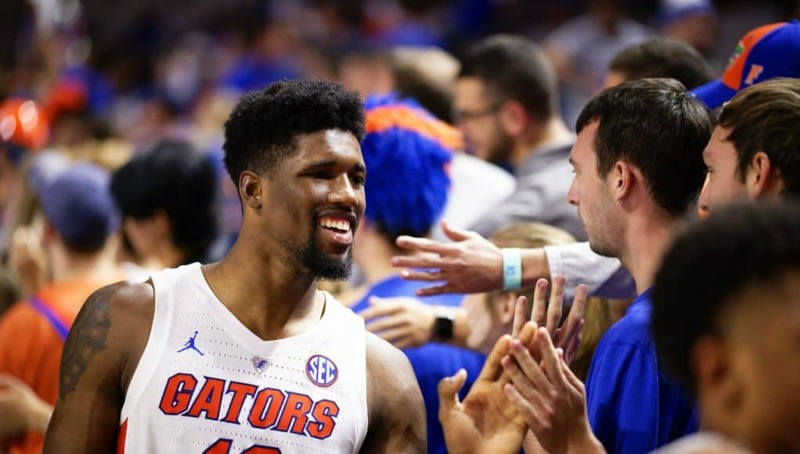 Bassett had struggled mightily in his time on the floor before that point, but came through just when Florida needed him most. Nevada fouled him on the play and he missed the free throw, but it wouldn’t matter. The Gators finally got the stops they needed on defense and just had to convert at the line a couple more times to seal it. The Martin twins scored well over half of Nevada’s points, as Caleb got 23 while Cody put up 19. While those two showed their star power. Florida gave a full team effort. Four players scored in double figures, led by Hayes and Hudson. Hayes went 5-for-6 from the field and 6-for-8 from the foul line for 16 points while also getting three big blocks. Hudson scored all but two of his 15 points in the first half. Meanwhile, Allen scored all 10 of his in the second half. Johnson also scored 10, and quietly had a double-double with 10 boards. Fellow freshman Nembhard produced in many ways with 8 points, 7 rebounds and 5 assists. 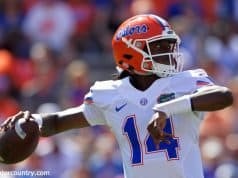 Florida is far from the most talented team in this field, but it is resilient, and that continues to carry the Gators late in the season. Florida will play the winner of 2-seed Michigan and 15-seed Montana in the Round of 32 on Saturday.